GoPro known for its use in action sports, has refreshed its entire range, including the addition of the 4k-capable HERO3 Black Edition. The existing HD HERO and HERO2 models have essentially been re-housed in smaller cases with updated user interfaces and will sit alongside the Black Edition as the White and Silver Editions, respectively. The Wi-Fi enabled HERO3 Black Edition is the most advanced GoPro, ever. No expense was spared during its development, resulting in a GoPro that is 30% smaller, 25% lighter & 2X more powerful than previous models. New resolutions and frame-rates include 4Kp 15, 2.7kp 30, 1080p 60, 1440p 48, 960p 100, 720p 120 and 12MP burst photo capture at 30 fps. It also features a Protune mode that offers higher bit-rates and a neutral color profile better suited to post-processing. The HERO3 Silver edition, is essentially a HERO2 in the latest smaller body, also gains Protune mode for its HD output - a feature added via firmware to existing HERO2 models. The latest models also gain Wi-Fi control to allow remote control via the recently-announced App, while the Black Edition includes a waterproof Wi-Fi controller. As mentioned, there is a White, Silver and Black edition. The MSRP are $199.99, $299.99 and $399.99 respectively. You can purchase the new HERO3 from B&H Photo. 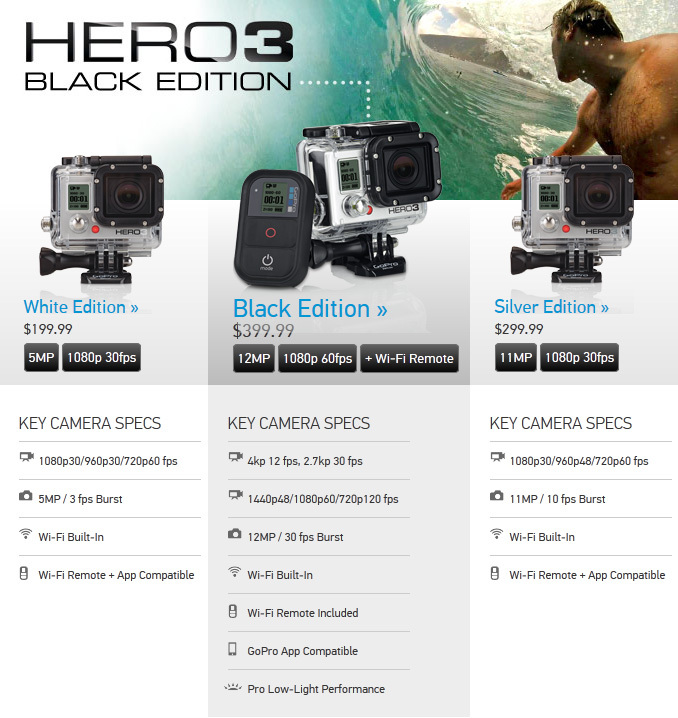 For a limited time, B&H Photo is having a sale on GoPro HERO2 for $199. So if you don't need all that new fancy features, the GoPro HERO2 is still a great choice. San Mateo, California (October 17, 2012) - GoPro, maker of the world’s most versatile and durable cameras and producer of today’s most engaging content announces the release of its new HD HERO3 camera line up in White, Silver and Black editions. Each new addition retains the iconic look of the previous award winning HD HERO cameras, but comes in about half the size of its predecessors and has built-in Wi-Fi technology. At the top of the new product line up, the HD HERO3 Black Edition is one of the most powerful camera systems available, delivering astounding 4K and 2.7K video resolutions all in the size of a small box of matches, making it easier to share your world. The White, Silver and Black editions are available for pre-order at GoPro.com and are shipping to specialty retailers around the world for MSRP $199.99, $299.99 and $399.99 respectively.